After six years of almost only diving from RIBs and spreading my clothes around my house, villa, or hotel room I`d decided it was time to see if I`d enjoy a week on a boat with a bunch of strangers. As a frequent solo traveller, I wondered whether the close confines of a cabin with a random snorer would see me sleeping on the deck by the second night. The allure of remote dive sites, unreachable by day boat, was strong enough for me to give it a go. 42 miles off the Egyptian coast, The Brothers Islands rise up from the floor of the Red Sea, 800 metres below, forming two small flat tabletops, surrounded by steeply sloping fringing reefs. The larger of the two sea mounts, the cunningly named Big Brother, is approximately 300 metres long, is one kilometre from its sibling, has a lighthouse, a 12-man army garrison, and would be a great location for a back-to-basics series of the “reality” TV show of the same name. As the only reefs around, and washed by strong nutrient-rich currents, I was attracted by their reported combination of soft corals, pelagics, sharks and two good-condition wrecks. Arriving last at the harbour in Hurghada the night before departure, and after the other guests had gone to their cabins, I was greeted by the shining pate and wide smile of Mimo, one of the dive guides. Over a welcome glass of fresh fruite juice, he explained where to show my dive gear, and gave me some even more welcome news: the 20-guest boat only had 12 passengers and so I would habe one of the eight below deck twin cabins to myself. No sooner had I littered the spare bed with camera bits, books, and t-shirts, I was introduced to Karim who kindly informed me that some dinner had been kept for me and was awaiting me in the dinning area. Splendid. 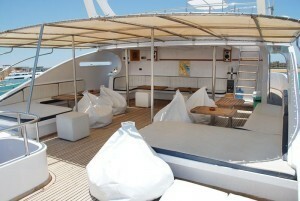 Covering six metres of the eight-metres width of the MY Blue Pearl, the mid-ship dining area an open plan affair adjoining the lounge that led onto the outdoor dive prep area at the stern. In the wall towards the bow was a magic hatch through which Karim or his brother Karemi, the other steward, would receive platter after platter of food from the chef Wael in the kitchen. Before the bow on the 36-metre long main deck were the crew quarters and rope storage area, and small deck used at prayer time. After reading the safety notices and emergency action plans pinned up next to the flatscreen TV in the lounge, I went outside and up the stairs to the shaded rear “chill-out” deck, did a circuit passing the portside double cabin , the large bridge, the front sun deck, the starboard double cabin, back eastern and then further up to the flybridge. Even if I had had to share, there was actually plenty of room to finde some personal space. As Karim enquired as to how I would prefer my breakfast eggs the next morning, I took in my fellow shipmates, all liveaboards veterans and mostly return customers. We were an eclectic, if slightly Germanic bunch. A German.Dutch couple, two German father and son combos, an Austrian quartet made up of a father, his son, the son`s wife, and a friend. The 12th man was James, a middle-aged, Libyan-based Scottish teacher and naturally my buddy. Seated in the lounge, Pia, the trip leader and diving instructor, took us through the bot and dive safety briefings. Given that we`d be at least five hours from the coast, the equipment was reassuringly plentiful and in good condition, the briefings friendly but to the point. Pia laid out the itinerary in her “best Bavarian English, Ja?. It was simple: Today would be spent on the coast diving at Gota Abu Ramada to check our gear, buoyancy, and to get to know our buddies, as habitually strong currents off the isolated Brothers would be no place for faffing, and to do a night dive before heading east overnight. Gota Abu Ramada is a shallow site, no deeper then 13 metres with large Australia-shaped reef with two large bommies off what would be the Perth coast (to the WSW). It was ideally suited to its purpose with no current, clear waters, small schools of blackspotted sweetlips and spot-fin squirrelfish, morays, crocodile fish, and a large school of yellowtail barracuda and goatfish to get reacquainted with camera settings. An artificial shark stuck on a knife as a part on HEPCA`s (Hurghada Environmental Protection and Conservation Association) shark protection awareness campaign, five metres below the surface, also amused the divers, who took turns to sit on its back during the safety stop one we had all demonstrated our ability to use an SMB competently. The night dive was my first from a liveaboard and was enhanced by the deck lights on the boat creating a full moon effect underwater, illuminating the bommies and the shark, and this providing visual markers. After a warming shower to wash away the goose bumps from a third hour-long-dive in 24 C water, we were greeted by the aromas of a giant buffet. Once dinner was over, the captain set a course eastwards, as some sat on the top deck watching the stars, and Karim and Karemi did a few card tricks in the lounge. I awoke to the sound of water lapping gently on the hull below my open cabin portholes, the early-morning light peeping in. From the deck Big Brother and its Victorian lighthouse took on a red-brown hue as we boarded two RIBs and headed to the northern tip of the island. The legendary currents appeared absent from the surface, but we did negative buoyancy entry and went straight down to 10 metres, meeting up above the beginning of the wreck of the SS Numidia, claimed to be one of the best wrecks in the Red Sea. She certainly looked huge and in good condition, give that she had spent more than a century exposed in her current-washed resting place. Build in Glasgow in 1901, the 140-metre long, 6,400 ton Numidia was on her voyage out of Liverpool bound for Calcutta with 7,000 tons of railway and general cargo when in the early hours of July 20th Big Brother`s lighthouse was sighted off the port bow and the Captain ordered a slight change of course to continue south passing alongside the island before retiring to his cabin. Fortunately for us, his orders were misinterpreted and the ship ploughed straight into the northern tip of the island. No lives were lost, much of the cargo was salvaged, but the sip went down, her keel digging into a rocky ledge. Now she sits on a steep slope, her bow melded into the top of the reef, her stern some 72 metres below. Hanging back, I let the others descend to try to add some scale to my pictures, capturing the lifeboat davits and the remains of the foremast in the centre of deck with a wide-angle lens as the group inspected the remains of the bridge and the engine room. Yet no image can convey quite how impressive this wreck is, dropping into the deep blue depths. Descending to join the group, going close to the wreck, I saw it was covered in soft corals and awash with burgundy and white striped Red Sea anthias and lionfish, accustomed to strong currents sheltering inside. O this day there was no need, with no current and good viz, conditions were ideal, and we spent the whole dive there, ascending past some coral-encrusted rolling stock bogies at 10 meres, before being picked up by the RIBs and taken back for breakfast. After catching a few rays on the sun deck, Pia and Mimo said it was time for a shark hunt on the southern plateau. As we were moored off the southern tip and in the absence of current, we would giant stride off the rear deck and return to the boat at the end. The plateau starts at a depth of 20 metres and slopes down to 40 metres, and is a hot spot for thresher sharks. As we reached 25 metres, Mimo`s arm shot out, finger extended towards the unmistakable scythe-like tail of a thresher shark swimming through a school of fusiliers. It stayed within view for a couple of minutes before we lost it. We hung around 28 metres as long as our 30 % nitrox mix would allow us, spotting a distant Thresher twice more, before ascending to the top of the reef and chilling out with the so-hail surgeonfish, before being invited to stuff ourselves again. The next five days followed the same pattern: Dive – breakfast – relax – dive – lunch – relax dive – dinner – relax. Due to the normally strong currents, the isolated nature of the location, and the considerable presence of sharks, there is no night diving in the Brothers. In fact, on most nights we didn`t need to get in the water to see them anyway. Whether you agree or not, it is accepted practice on liveaboards to throw organic waste overboard in the evening, and the sharks seemed to be in on it, especially at Little Brothers. Leaning on the side rails with the crew after dinner, we often saw oceanic white tip and silky sharks patrolling around the boat. Big Brothers`s other iconic dive site is the wreck of the Aida, a 75 metre supply vessel build in France in 1911 that sank on 15 September 1957 when resupplying the lighthouse and Egyptian army garrison stationed there. Approaching the jetty in heavy seas, she was slammed onto the rocks and abandoned immediately. After drifting north slightly, she went down south of the Numidia, just past the end of the island. Her bows no longer exist, but from her midships at 25 metres to her stern at 60, she is in excellen condition, adorned with purple soft corals and hard corals, anthias, morays, and the usual reef dwellers. She was the last dive of the second day, and the first dive the next morning when a gentle current helped us onto th Numidia and then along the wall past a large school of black snapper hanging on the corner of the reef. The walls of Big Brother were also home to friendly, 90 centimetre female Napoleon wrasse called Mousie. After another successful Thresher-spotting trip over the southern plateau, Mousie and I flirted gently for a few minutes infatuation was sadly cut short by my dive computer and my buddy`s air consumption, but I reckon I`d scored. On our last Big Brother dive we had a slightly stronger south to north current, and no sooner had we dropped in we were greeted by a juvenile giant manta, approximately four metres across, riding the current and flanked by a barracuda, closely followed by three grey reef sharks. The action wasn`t over; as we loitered expectantly a 1.2 metre male Napoleon came amongst the divers creating a scene akin to a publicity starved celebrity (quite appropriate given the location) willingly posing for the paparazzi. He left abruptly, diving fast, to chase off a small grey reef shark sniffing around his patch. 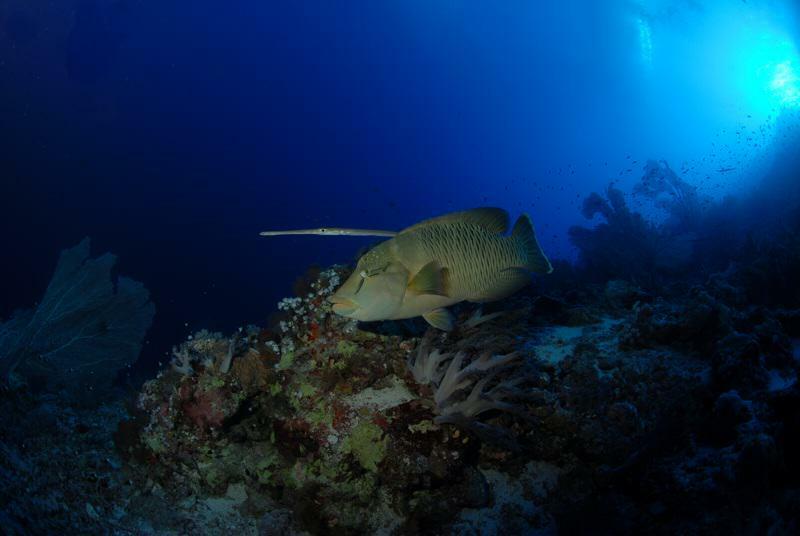 Moving north slowly, cornet fish hugged our tanks,using us for streamlining and cover as they looked for prey to ambush amongst the schools of anthias whilst we found pipfish amongst the gorgonians. As we moved closer to the surface, a manta possible one, cruised along below to bid us farewell. Big Brother had been excellent – could Little Brother follow suit? It had two days to outdo its sibling and did not disappoint. After an uneventful 15 minutes deep in the blue looking for sharks we moved closer to the wall. A quarter of an hour later we had seen a male grey reef shark, two threshers, a curiously un-shy silky shark, and had been entertained by an even bigger male Napoleon wrasse. The last four dives were just as impressive. The male napoleon wrasse was often under the boat waiting to tag along on a dive, the pregnant reef shark (Carcharhinus amblyrhynchos) seemed to live near the mooring site, threshers milled around to the south below a magnificent gorgonian forest, home to a longnosed hawkfish, round the corner from a section of wall festooned with broccoli-like soft corals. In the normally washing machine-like shallows, we off-gassed with black-tongue unicornfish having parasites removed by cleaner wrasse, pufferfish, moray eels, orangespine unicornfish, barracudas and an octopus, thanks to the remarkably still waters. The icing on the considerable cake was provided by an oceanic whitetip and its accompanying pilot fish that came by to say hello. It would`ve been unfair to expect the final day`s diving in Safaga to compare, but Panorama reef had interesting seven metre high, mountain like dome coral formations, anemone-fish and two turtles. The snorkelling boats at Tobia Arbaà also provided much amusement from above and below the surface, and the shasllow waters of the goldie covered coral bommies were aslo home to blue spotted stingrays and lionfish. Rather than being a letdown, these two sites, two of the best in the area, served as a reminder of how spoilt we had been. The whole experience had been excellent. There was plenty of room on the boat and I spent so little time in my cabin awake that sharing would have been no problem. The constant sound of the ocean was soothing and we never had to share dive site with another group. In fact, each buddy team often went at its own pace and Jame and I were frequently alone at the end of a dive, hanging out with the fish. In short, I can safely say that I am a liveaboard convert and would thoroughly recommend a trip to the Brothers.